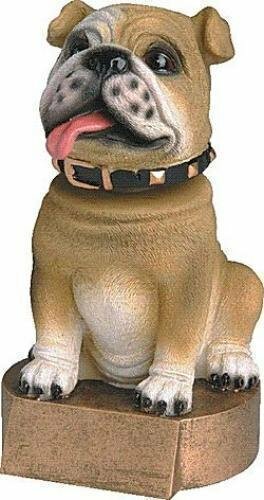 The head of the Brown Buldog mascot bobbles when the trophy is moved. The bobblehead makes a fun resin award or trophy for school activities and sports teams. It includes a brushed gold plate with up to 3 lines of black engraved letters. 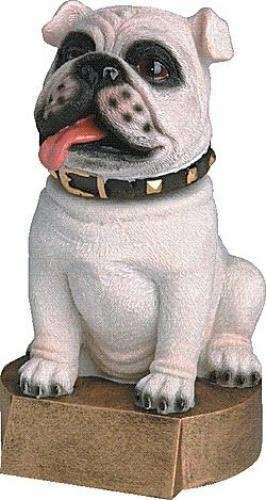 The head of the White Bulldog mascot bobbles when the trophy is moved. The bobblehead makes a fun resin award or trophy for school activities and sports teams. It includes a brushed gold plate with up to 3 lines of black engraved letters. The head of the eagle mascot bobbles when the trophy is moved. The bobblehead makes a fun resin award or trophy for school activities and sports teams. It includes a brushed gold plate with up to 3 lines of black engraved letters. This is a great choice for an economy eagle trophy. 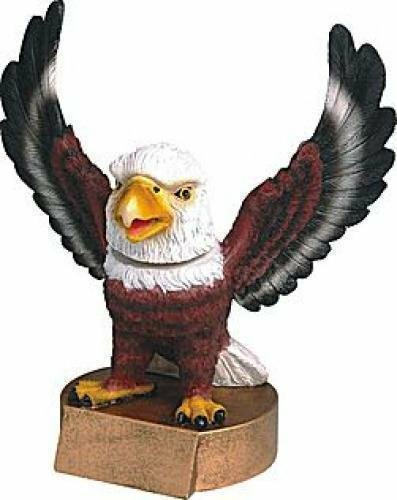 Choose a cheap eagle trophy for your team or tournament trophy event. FREE Shipping is available on orders cheap eagle trophies over $100. FREE Engraving. 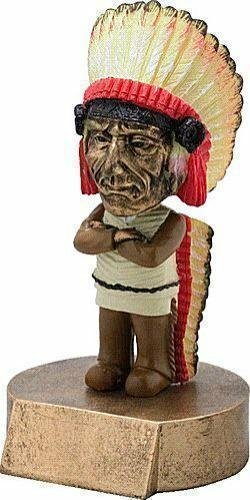 The head of the Indian mascot bobbles when the trophy is moved. The bobblehead makes a fun resin award or trophy for school activities and sports teams. It includes a brushed gold plate with up to 3 lines of black engraved letters. 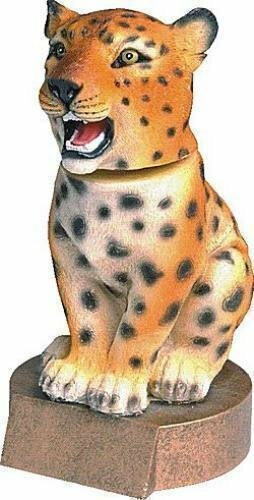 The head of the Jaguar mascot bobbles when the trophy is moved. The bobblehead makes a fun resin award or trophy for school activities and sports teams. It includes a brushed gold plate with up to 3 lines of black engraved letters. The head of the Knight / Crusader mascot bobbles when the trophy is moved. The bobblehead makes a fun resin award or trophy for school activities and sports teams. It includes a brushed gold plate with up to 3 lines of black engraved letters. 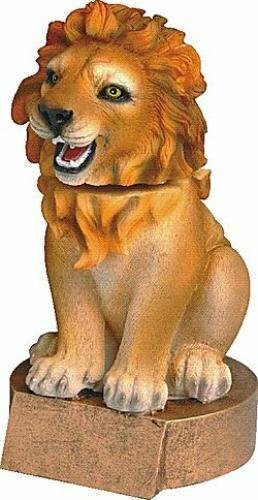 The head of the Lion mascot bobbles when the trophy is moved. The bobblehead makes a fun resin award or trophy for school activities and sports teams. It includes a brushed gold plate with up to 3 lines of black engraved letters. 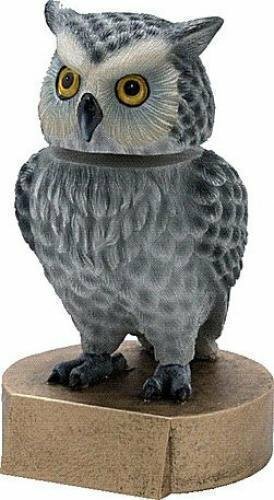 The head of the owl mascot bobbles when the trophy is moved. The bobblehead makes a fun resin award or trophy for school activities and sports teams. It includes a brushed gold plate with up to 3 lines of black engraved letters. 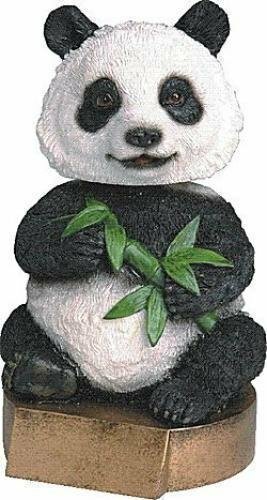 The head of the Panda mascot bobbles when the trophy is moved. The bobblehead makes a fun resin award or trophy for school activities and sports teams. It includes a brushed gold plate with up to 3 lines of black engraved letters. 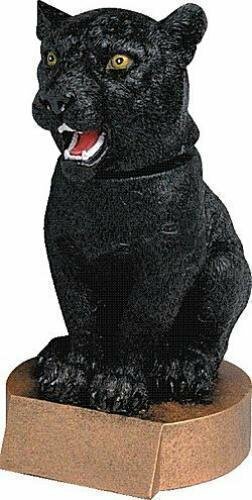 The head of the panther mascot bobbles when the trophy is moved. The bobblehead makes a fun resin award or trophy for school activities and sports teams. It includes a brushed gold plate with up to 3 lines of black engraved letters.